A fab new programme has been launched to teach beginners how to learn to play the ukulele – here we take it for a quick review to see what it’s all about. Although learning to play can be quite easy, many who have perhaps never played an instrument before or who have absolutely no musical knowledge can find it quite a challenge. There are also some groups or gatherings that are available in local towns and cities all over the country to help people learn to play (and also socialise over a coffee or even a beer! 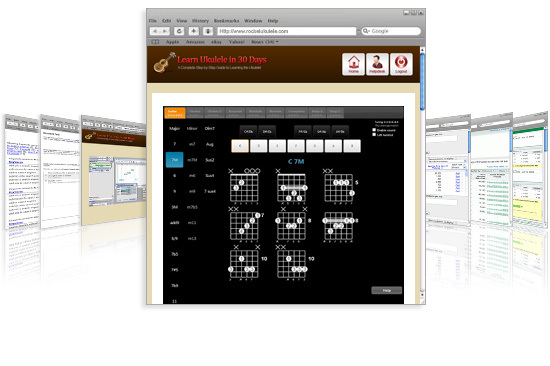 ), but if these aren’t available close to you, then this great method of learning to play might not be available. The programme is fascinating as it takes a complete beginner from the phases of learning, all the way through to mastering the instrument, including techniques like playing songs by ear and learning to read and write your own music. It goes beyond just learning the instrument and teaches the fundamentals of music as a whole. This makes it suitable even for those that can already play the instrument as it offers the tools, tabs and community to further your playing abilities and your love for all things ukulele! There is currently a limited-time offer to join for $27 (around £18 or the price of a round of beers/coffee?) that has been reduced from a shade under $80 – and as it offers a lifetime subscription, the fee is a one-off and doesn’t recur every month which makes it pretty good value even if you were to just try it out. And then, even if you were to find out that it’s not suitable for you, they offer a 60-day “no questions asked” money-back guarantee as they are so confident in the programme’s ability, which for us, really sold it to us completely. The quality of it is actually very high with everything offered via their website, which makes accessing every part of the programme very easy even if you aren’t at your laptop. Additionally, the support from the forum and ukulele teachers was excellent and fast. We have no issue in recommending this to our readers and even if you don’t like the programme or think that it doesn’t represent value, you can always get your money back. Let us play the Banjolele! The banjolele (banjo ukulele or banjo uke) has a banjo-style resonator body and a fretted extended ukulele-style neck and was derived from the banjulele-banjo, introduced by Alvin D. Keech in 1917. The banjolele hybrid combines the unique construction and distinctive tone of the banjo, with the small scale, tuning and playing style of the ukulele. 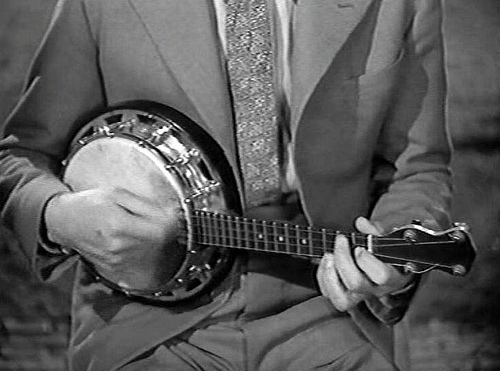 Although the banjolele achieved its greatest popularity in the 1920s and 30s, thanks to the endorsement from the British singer and comedian George Formby, due to its relative simplicity and portability, there has been a recent increase in demand for the instrument. The small, light-hearted music often associated with the ukulele and in particular, the banjolele is that of George Formby, who developed his own style of playing in accompaniment to his comical songs. However, the banjo, ukulele and banjolele hybrid have seen a resurgence in popularity since the birth of indie folk music over the last couple of years, with folk rock bands, such as Noah and the Whale featuring a ukulele and Mumford & Sons featuring a banjo in their most popular tracks. Therefore it came as a complete and utter shock when TfL (Transport for London) banned buskers on the tube from playing not only the banjo, but now also the banjolele. 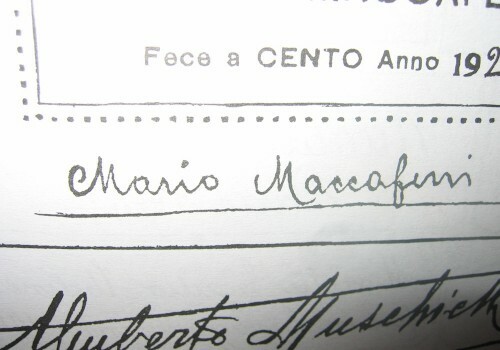 Mario Maccaferri, born in Centro, Italy in 1900, trained as a classical guitarist and a traditional instrument luthier from the age of 11, under the guidance of Luigi Mozzani. He later moved to Paris where he invented the warp-resistant Isovibrant reed in 1935. In 1939, Mario, his wife Maria, and their daughter visited America and while in New York, they attended the World’s Fair, where Mario was first introduced to a brand new material known as plastic. He decided to stay in America and set up a small factory in the Bronx, naming his new business the French-American Reed Company. He became fascinated by plastic, and once he got hold of an injection-moulding plastic machine, Maccaferri realised the full potential of this newfound material. He was able to create plastic reeds and later, plastic clothespins at a rate of more than two million each day. This was the birth of his plastic empire: Mastro Plastics Company, in which he went on to create fishing lures, tape dispensers, clothes hangers, acoustic ceiling tiles etc. Official UK Distributors for Worth Strings! We are very excited to announce we are now the proud distributors of Worth Ukulele Strings. Strings are one of the most important factors in creating a great sound and a good set of strings can make all the difference to even the cheapest of ukuleles. It is extremely difficult, as any uke enthusiast will tell you, to find the perfect strings for your ukulele. Getting the balance right between power (volume) and tension of a string is almost impossible. Made in Japan, from Fluorocarbon, which is the same material used to make fishing lines, Worth Strings are incredibly flexible and strong. Worth Strings are arguably the closest you can get to perfection. They have a unique bright, loud and clear sound, with easy string action and they settle in very quickly. They are temperature and humidity stable and seem to last much longer than their competitors, such as Aquilas. The bonus of buying Worth strings is that they come in double length sets, so each string is actually twice the length you require, so you can either keep the spare set, or use them on another uke if you own more than one – and let’s face it – which ukulele player doesn’t? 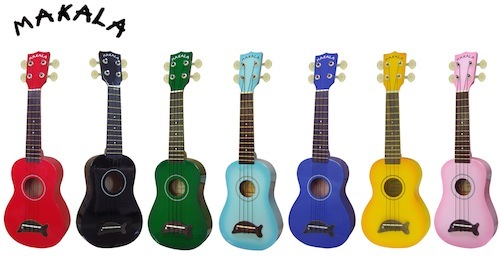 So, if you want to make your uke sing, we recommend a set of Worths. We have the Brown and Clear strings in stock, in both Light and Medium, which you prefer is down to personal taste. So, I decided that I wanted to get hold of a Favilla uke for the store as I know they are good quality and are tremendously good value for money – especially when compared to Martin, which command high prices, without exception. It arrived today and I just had a good look at it. Well. What can I say. I love it. In fact, I’m almost loathe to say that I prefer it to the Martin Style 0 we have in stock. It just sounds phenomenal and is in fantastic condition, with just a few minor scratches. I am very, very tempted to keep it to myself; especially since it has been delivered in the cutest case with what feels like the softest rabbit fur (it’s not, for all your animal lovers out there). What can I say, I am just bessoted. If we do decide to put it online, I can promise you. It will not hang around for long. 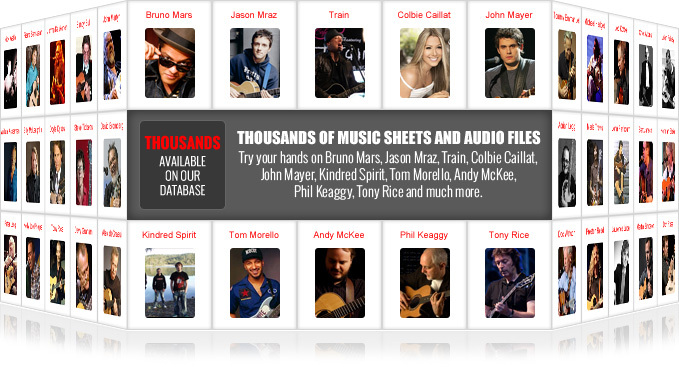 I will try and get a sound sample online for you all to hear just how amazing it sounds. (And pictures too; just realised we don’t have any ready just yet). Today is our official launch of the store! Apologies for those of you who have been browsing prior to today, but we – rather unwisely – decided to develop the website in a live environment and somehow an influx of visitors managed to find it before it was complete. What this means for you is that the product selection is fully viewable now with all images etc and we will be looking to enhance the image selection to ensure that it is as close as possible to you viewing the products as if you were holding them in your own hands. All prices have also now been adjusted to reflect each product’s true value. Please feel free to peruse our selection of ukuleles and hopefully we will have many other unique ukes and accessories for you soon! It’s no secret that Kala are storming the ukulele world with their incredible ukuleles; although ‘Made in China’ – and even stickered as so – their ukuleles offer a level of value and quality never really seen before. Now, having recently been flirting with classic plastic ukes, as were popularised in the 50’s primarily by Maccaferri, the Makala budget line from Kala has recently brought a new plastic ukulele to the plastic ukulele table. They call it ‘The Dolphin’ or the MK-SD for trainspotter-types and is made with a plastic back-piece which makes up the back and sides of the uke. Even at roughly £30 RRP, the build quality is maintained from the Kala range and the plastic back and sides really help to resonate the soundboard in order to achieve the biggest, punchiest sound from the cheap materials used. Cheap strings are supplied as standard from GHS and if you have ever played on a uke with these previously, you will be familiar with the plasticky, cheap feel they have – especially when sliding up and down the fretboard. Immediately switching these out for fluoro-carbon Worth Brown strings made an immediate and distinct difference; the ukulele really came to life and I have yet to come across a sub-£100 ukulele to really sound better. Obviously, different folk will have their preference when it comes to the strings selection and whether it be Aquila or D’Addario strings that tickle your fancy, rest assured you really won’t be disappointed stringing up one of these as your backup or throw-around instrument. We are hoping to start selling these with an improved strings setup, sometime in the near future. Please let us know below, if this would be of interest to any of you! Marc Jacobs x Peseta – old news, new joy. It took a while for me to stumble across this bag (obviously, this looks bad since we are closely tied to the fashion industry too) but I must say that this collaboration between Peseta and Marc Jacobs is quite an appealing accessory for the ukulele lover. For me, I was simply looking for a bag – and not a case – that I could actually travel with and would cope with the needs of lugging around a diminutive instrument, but offer the protection it needs. Now, to be honest – it isn’t the most robust bag, and the selection of reverse denim and beige/off-white canvas isn’t exactly the most dirt-repellent combination of fabrics ever chosen. It also lacks padding, so the ukulele will probably need a gig bag or lots of weekend clothing to keep it safe and snug inside. But what this bag lacks in practicality-of-padding, it more than makes up for with looks and styling. When full, it really does look smart and the innards of the bag are lined with a gingham check of red or blue (to match the handle detail on the outside, depending which option you choose) with a few pockets for storing random other items like your cleaning rag, tuner, capo, fast fret etc. We would love to sell these in the future, but it is probably fairly unlikely. 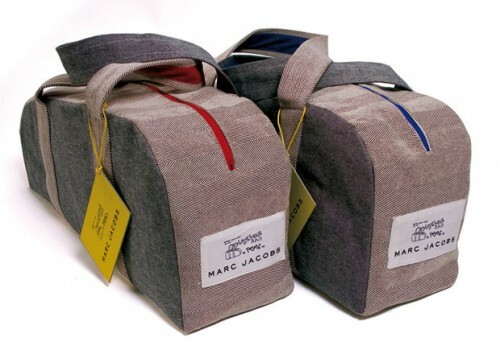 Currently available from Marc by Marc Jacobs – 56 South Audley Street, London W1 in Red or Blue. Welcome to our blog and ukulele shop. So, we have finally found our home on t’internet and are happy to announce our new presence at Ukenique.com. It’s been a long time coming for a specialist ukulele retailer in the UK and we felt it was our duty to bring you some of the finest new and vintage ukulele instruments and accessories from around the world – including Hawaii, of course. 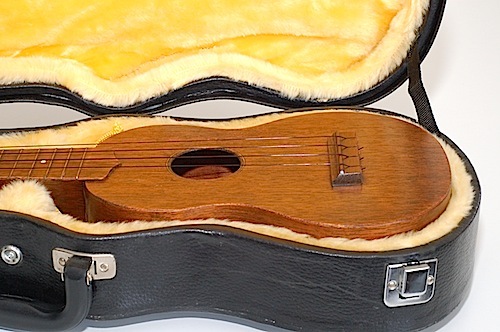 On this, our homepage, we will be writing about anything ukulele-related that tickles our fancy and give you sneak previews of upcoming acquisitions.